Forgot empathy on your way to become an inspiring leader? Empathy is a critical skill of an inspiring leader. Some of us are good at it while many struggle and stumble on a series of recurrent, typical empathy mistakes. How about you? How many of the typical mistakes would you be inclined to make (or avoid)? Let’s do the test. Put yourself in the following context: imagine a colleague comes to you and shares a frustration (“it’s impossible to realize my objectives with the scarce resources I have”), a setback (“I lost that important tender”; “I didn’t get that important promotion”), or a failure (“I made a blatant error in that important presentation”). What are your typical first reactions? For each of the 10 reactions in this test, indicate how much it ‘comes natural to you’. Count the number of times you have answered ‘frequently’ or ‘constantly’. Be honest with yourself: how many of those 10 ‘empathic reactions’ do you practice? Only 1 or 2, or actually most of them, say 7 or 8 regularly? Actually, your score doesn’t matter! 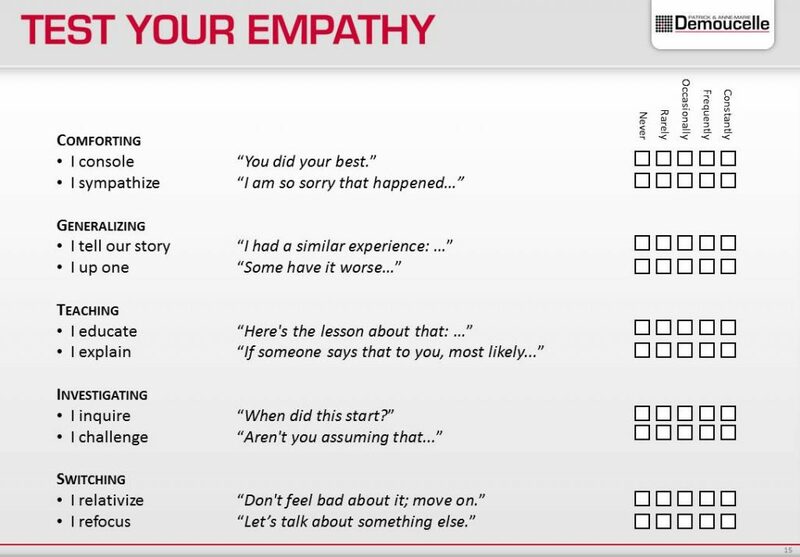 Because this is not a test of what empathy should be, this is a test of the 10 typical empathy mistakes – remember, the initial reactions not to have. So if you scored ‘frequently’ or ‘constantly’ on 4 items, that gives you 4 poor habits to deconstruct. The higher your scores, the lower your true empathy. Then turn the table: imagine you decide to share a big frustration with a colleague, and their first reaction is “some have it worse”, “let’s talk about something else”, or “let me tell you one lesson”. How would you feel? Feel understood or feel brushed aside? So what is true empathy then? Empathy is making one feel understood. By putting yourself in their shoes. As long as people don’t feel understood by you, they consider your remarks irrelevant (“Why would I listen to you? You don’t understand my situation any way!”). It’s only when they know you truly understand them, that they will be open to your subsequent reactions. Empathy is making one feel understood. By walking 3 steps in their shoes. – To sense what the other person needs (empathic concern). Empathy is making one feel understood. By showing the desire to get into their shoes. Several supporting skills are very helpful to start with, such as creating rapport, deep listening, reading body language, connecting the dots, expressing and testing understanding, leading and pacing, and helping them create what they need. You are motivated (or some team members are), but it doesn’t come easy (to them)? You might consider getting a coach or a trainer, in order to develop empathy, at the 3 levels (thoughts, feelings, needs), and to train the supporting skills extensively and relentlessly.